Katyycoconut is a stylish shredder with some serious yoga poses. Check out her Instagram to see what I mean. I think skateboarding is rolling yoga and I’m totally inspired by Katy’s handstands! 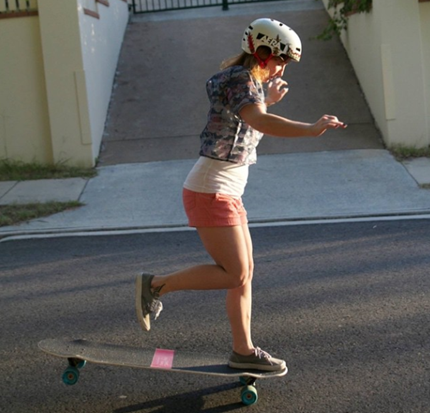 One of the best things about this blog is learning there are girls everywhere skating. And then finding out how incredible these skater girls are. Katy inspires me with her stylish skating and positive attitude. Ananas_selina is practicing her nose manuals – one footed nose manuals. She’s also a foodie & a writer. Plus she founded @vietshred. Viet shred supports the growth of the longboard community in Vietnam! Their motto is have fun shredding – I couldn’t agree more – shredding should be for fun. And for me keep it fashionable – which Ananas Selina obviously does!